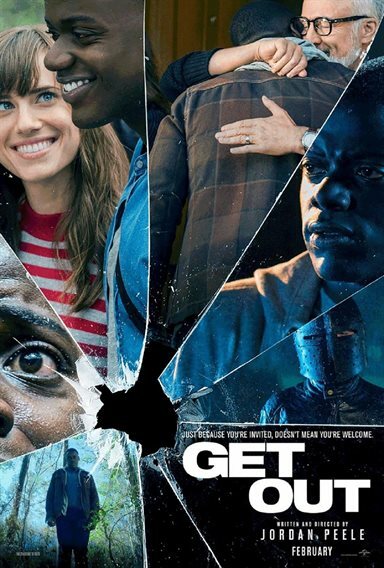 Now that Chris (Daniel Kaluuya, Sicario) and his girlfriend, Rose (Allison Williams, Girls), have reached the meet-the- parents milestone of dating, she invites him for a weekend getaway upstate with Missy (Catherine Keener, Captain Phillips) and Dean (Bradley Whitford, The Cabin in the Woods). Equal parts gripping thriller and provocative commentary, Get Out is written and directed by Peele (Key and Peele) and produced by Blumhouse’s Jason Blum, as well as Sean McKittrick (Donnie Darko, The Box), Edward H. Hamm Jr. (The Box, Bad Words) and Peels. The film also stars Caleb Landry Jones (X-Men series), Stephen Root (No Country for Old Men), Milton “Lil Rel” Howery (The Carmichael Show), Betty Gabriel (The Purge: Election Year), Marcus Henderson (Pete’s Dragon) and Lakeith Stanfield (Straight Outta Compton). Download Get Out in Digital HD from the iTunes store. Get Out images are © Universal Pictures. All Rights Reserved. Jordan Peele is known for being a comedian. Along with his partner Keegan Michael Key (Why Him? ), they have starred in their own sketch comedy show and last year's successful movie, Keanu. So it's a little surprising to see he has written and directed a horror film called Get Out. Based on his background it doesn't seem like a natural progression and it's difficult to imagine what to expect, but the movie was surprisingly pretty good and Peele has another credit to add to his show business career. Rose (Allison Williams; Girls) and Chris (Daniel Kaluuya; Sicario) have been dating for five months and they decided it's time to meet the family so Chris is joining Rose at her parents' home for the weekend. However, Chris is worried because Rose hasn't mentioned to her white parents that Chris is black but Rose doesn't seem worried. When they arrive it seems Chris's fears were for nothing as Rose's parents embrace him with open arms. Throughout the weekend, everyone seems very nice to Chris but he can't shake a sense of uneasiness as things seem to be a bit "off". All of the other black people he encounters in this small upstate NY town seem to be in a bit of a trance and at one point he is sure Rose's psychotherapist mother hypnotized him to help him stop smoking (among other things). Only after a party hosted by Rose's parents does the truth behind the strange behavior come out and by then it is too late for Chris. I was shocked to see what came out of such a funny mind but Peele proves there is a darker side to him and his directorial debut shows a great deal of promise. While the story is more creepy than actually scary, it is a unique idea that engrosses the audience for the most part. The beginning starts a little slow but once the film builds momentum it doesn't stop until the end. Of course, Peele being Peele, he did add some funnier lines that had the audience laughing. His eye for detail, along with his visuals, moved the movie along nicely. My issues with the film come in the form of the music and the plot details closer to the end. I didn't like many of the musical choices and found a few of them to be almost distracting. Some unique songs with an African flare didn't seem to really fit in the overall scheme. Also, the twist that added another dimension to the plot seems extremely farfetched and made me scratch my head. Up until that point in the film, I thought Peele had a great story going but the ultimate reason for the hypnosis of the black people was too over the top for me. The cast is terrific and Williams and Kaluuya are well suited to these roles. I have a particular soft spot for Bradley Whitford (The West Wing), who plays Rose's father, Dean, and Catherine Keener (Captain Philips) who plays her mom, Missy, is well cast as the psychologist motherly type with a touch of sinister hidden just beneath the surface. LilRel Howery (The Carmichael Show) adds some great comic relief as Chris's friend, Rod. The only one I really didn't like was Caleb Landry Jones (X-Men: First Class) as Rose's brother, Jeremy. He was simply too weird for a family trying very hard to seem normal and he acted more like a high school student than a medical student. Ultimately, Peele has a solid script and a knack for storytelling in an appealing way which makes Get Out is more enjoyable than many of the other suspense/thriller/horror movies being made today. Adding a touch of humor also makes the film more appealing and brings a little fun to an otherwise disturbing story. #getout I really wanted to see this movie. It looks a little scary! I am SO unbelievably excited to see how this movie plays out. I'm a HUGE fan already!